The Franklin Station was a one and 1/2 story wood station. 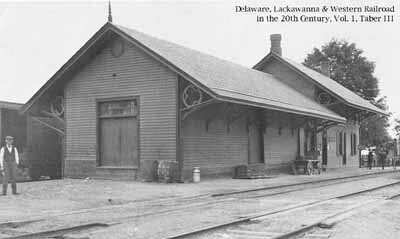 While it was served also by the NYSW, it was constructed and maintained by the Sussex Railroad and later the Lackawanna. Early on there was a turntable near the station which may have been abandoned when the Lehigh & Hudson River bought the South Vernon Branch to McAfee. The Franklin branch (Warbasse to Franklin) was abandoned in June/July 1934. The station burned down January 1, 1958.